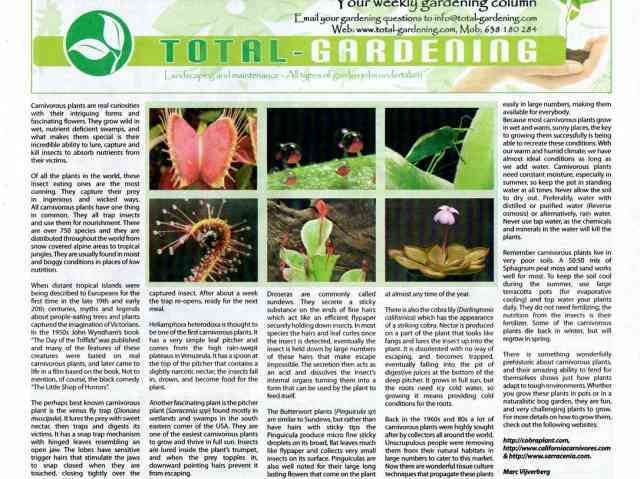 Carnivorous plants are real curiosities with their intriguing forms and fascinating flowers. They grow wild in wet, nutrient deficient swamps, and what makes them special is their incredible ability to lure, capture and kill insects to absorb nutrients from their victims. 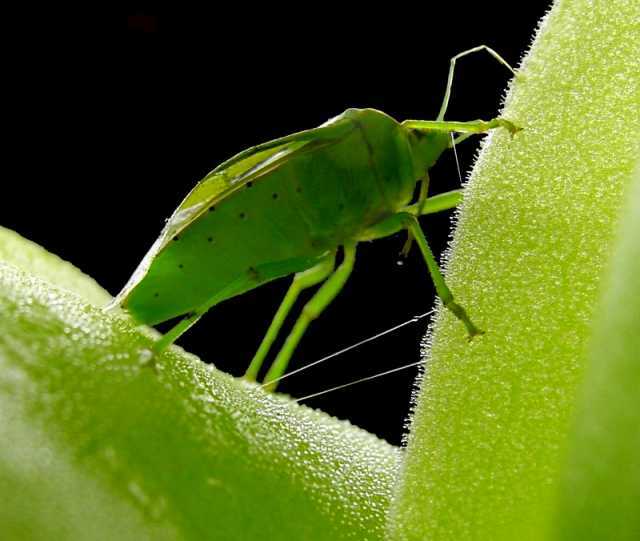 Of all the plants in the world, these insect eating ones are the most cunning. They capture their prey in ingenious and wicked ways. 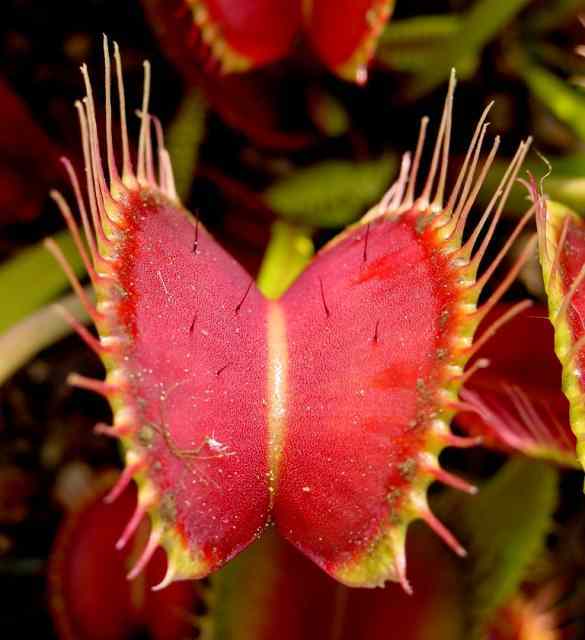 All carnivorous plants have one thing in common. They all trap insects and use them for nourishment. There are over 750 species and they are distributed throughout the world from snow covered alpine areas to tropical jungles. They are usually found in moist and boggy conditions in places of low nutrition. When distant tropical islands were being described to Europeans for the first time in the late 19th and early 20th centuries, myths and legends about people-eating trees and plants captured the imagination of Victorians. In the 1950s John Wyndham�s book �The Day of the Triffids� was published and many of the features of these creatures were based on real carnivorous plants, and later came to life in a film based on the book. Not to mention, of course, the black comedy �The Little Shop of Horrors�. 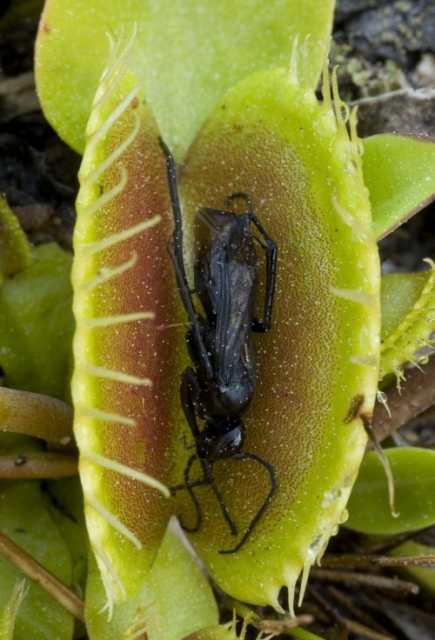 The perhaps best known carnivorous plant is the venus fly trap (Dionaea muscipula). It lures the prey with sweet nectar, then traps and digests its victims. It has a snap trap mechanism with hinged leaves resembling an open jaw. The lobes have sensitive trigger hairs that stimulate the jaws to snap closed when they are touched, closing tightly over the captured insect. After about a week the trap re-opens, ready for the next meal. 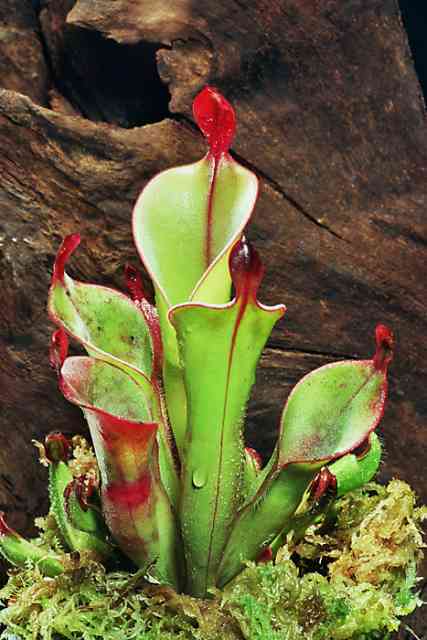 Heliamphora heterodoxa is thought to be one of the first carnivorous plants. It has a very simple leaf pitcher and comes from the high rain-swept plateaus in Venuzeula. It has a spoon at the top of the pitcher that contains a slightly narcotic nectar; the insects fall in, drown, and become food for the plant. Another fascinating plant is the pitcher plant (Sarracenia spp) found mostly in wetlands and swamps in the south eastern corner of the USA. They are one of the easiest carnivorous plants to grow and thrive in full sun. Insects are lured inside the plant�s trumpet, and when the prey topples in, downward pointing hairs prevent it from escaping. 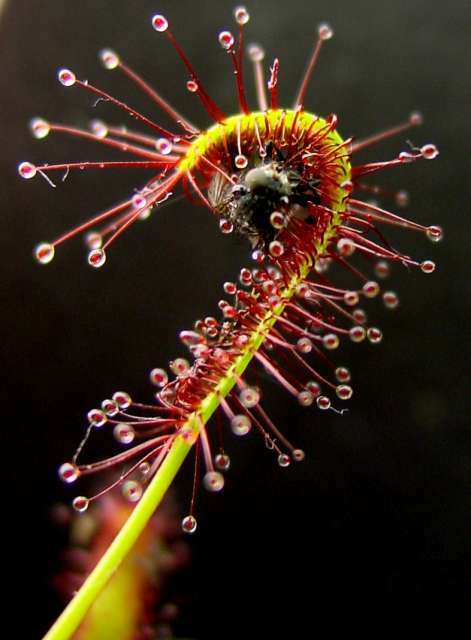 Droseras are commonly called sundews. They secrete a sticky substance on the ends of fine hairs which act like an efficient flypaper securely holding down insects. In most species the hairs and leaf curles once the insect is detected, eventually the insect is held down by large numbers of these hairs that make escape impossible. The secretion then acts as an acid and dissolves the insect�s internal organs turning them into a form that can be used by the plant to feed itself. 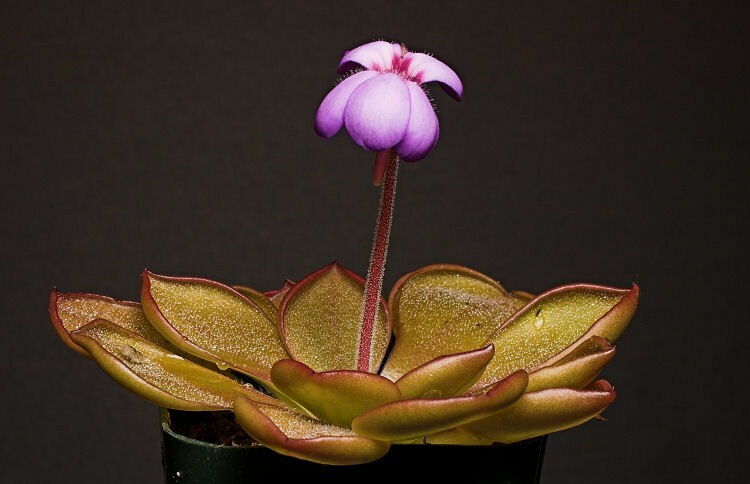 The Butterwort plants (Pinguicula sp) are similar to Sundews, but rather than have hairs with sticky tips the Pinguicula produce micro fine sticky droplets on its broad, flat leaves much like flypaper and collects very small insects on its surface. Pinguiculas are also well noted for their large long lasting flowers that come on the plant at almost any time of the year. 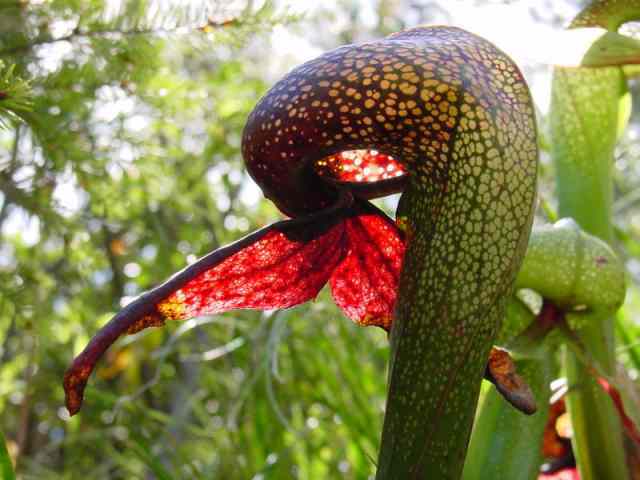 There is also the cobra lily (Darlingtonia californica) which has the appearance of a striking cobra. Nectar is produced on a part of the plant that looks like fangs and lures the insect up into the plant. It is disoriented with no way of escaping, and becomes trapped, eventually falling into the pit of digestive juices at the bottom of the deep pitcher. It grows in full sun, but the roots need icy cold water, so growing it means providing cold conditions for the roots. Back in the 1960s and 80s a lot of carnivorous plants were highly sought after by collectors all around the world. Unscrupulous people were removing them from their natural habitats in large numbers to cater to this market. Now there are wonderful tissue culture techniques that propagate these plants easily in large numbers, making them available for everybody. Because most carnivorous plants grow in wet and warm, sunny places, the key to growing them successfully is being able to recreate these conditions. With our warm and humid climate, we have almost ideal conditions as long as we add water. Carnivorous plants need constant moisture, especially in summer, so keep the pot in standing water at all times. Never allow the soil to dry out. Preferably, water with distilled or purified water (Reverse osmosis) or alternatively, rain water. Never use tap water, as the chemicals and minerals in the water will kill the plants. Remember carnivorous plants live in very poor soils. A 50:50 mix of Sphagnum peat moss and sand works well for most. To keep the soil cool during the summer, use large terracotta pots (for evaporative cooling) and top water your plants daily. They do not need fertilizing; the nutrition from the insects is their fertilizer. Some of the carnivorous plants die back in winter, but will regrow in spring. There is something wonderfully prehistoric about carnivorous plants, and their amazing ability to fend for themselves shows just how plants adapt to tough environments. Whether you grow these plants in pots or in a naturalistic bog garden, they are fun, and very challenging plants to grow.